Recently, the Dutch wastewater treatment company Triqua commissioned its seventh sewage treatment plant in the Caspian Sea. This time at the request of Daewoo Shipbuilding & Marine Engineering Company in Korea (DSME), for installation on a shallow water drilling barge, under construction for operations in the Zhambyl field in the Caspian Sea. The drilling barge is designed by Friede and Goldman (F&G), a marine architectural company in Houston, Texas, who received a request from the Korean National Oil Company (KNOC), to design the shallow water drilling barge to search for oil and gas reservoirs. F&G engineers designed a barge measuring 100 x 40 m with all drilling equipment and accommodations for 100 people on the main deck. DSME commissioned the build of the shallow water drilling barge for the Zhambyl project and delegated specialised, on board projects to suppliers such as Triqua, based in Wageningen, the Netherlands. Triqua’s job is to purify wastewater from the vessel. The treated wastewater will be purified to drinking water quality. Part of the purified water will be reused for toilets, washing machines and to make concrete. Daewoo and Triqua chose a Membrane Bioreactor with pre-and post-treatment. The system is compact and tailored to the available space for the specific location. Besides its compact nature, the technology has extensive purification power. Transported in August 2011, the system will be put into full operation in the spring of 2012, meeting the agreed upon delivery date. Triqua credits the timely delivery to a positive cooperation with the customer. The destination of this project is an area where both high discharge requirements and extreme environmental factors (climate, position and location) play a role. Thus, the system must be resistant to temperatures ranging from 40°C in the summer to -40°C in the winter. Such projects have to comply with high customer specifications dealing with health, safety and environment. Systems for these locations with extreme conditions are built fully redundant, in order to switch to a backup system if the need presents itself. Additionally, Kazakhstan has strict regulations about wastewater discharge from offshore sites in the Caspian Sea. The area is a conservation reserve and a breeding ground for the protected sturgeon population. Therefore, all accommodation facilities in this area require an advanced wastewater treatment system. Since 2001, Triqua has supplied total wastewater solutions in the Caspian Sea. The company operates worldwide and reports the following oil companies and contractors on its client list: Agip-KCO, Deutag, Sunkar Parker Drilling, Emtunga, BP, McDermott, Aker Kvaerner, Wagenborg, Rossetti and Consafe. Made to measure, Triqua builds complete wastewater treatment plants in modules, and places the plants in containers, depending on the space requirements allotted on the barge. After extensive testing at Triqua, the system is ready for transport by truck or vessel. As a total solutions supplier, Triqua ensures the client’s technical staff receives the necessary knowledge through product training. The company also provides analytical equipment to the client, but also monitors trending data daily via the Internet. "It is not necessary for the client to have technological knowledge, since our knowledgeable staff can watch remotely. Remote Assistance through the system technology, allows us to intervene in time if needed", says Joris van der Ven, managing director of Triqua. Triqua also draws up service contracts to outline the next steps for their clients, which include provision of technical assistance, annual on-site inspection for possible defects by operators with training for new personnel, and supply of spares and consumables. This year Triqua celebrates its 15th anniversary. 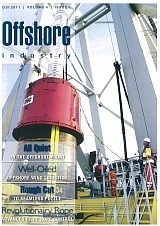 The company now focuses on total process water solutions for the industries offshore and shipping. According to Van der Ven, customers prefer a company that displays flexibility, expertise and innovative solutions. "Working closely with our clients, we seek the most efficient, sustainable solution for the issue at hand. Customer support is an important factor for Triqua. In industry this is reflected by DBFO (Design, Build, Finance and Operate – ed) contracts becoming the norm, whereas our customers in the offshore branch opt for service contracts, with Remote Technology Assistance proving to be an important tool." Triqua credits its repeat orders and positive references to their emphasis on quality and advanced technology. "We act as a total solutions supplier for problem analysis, engineering, manufacturing and after sales service. Our R&D personnel consult closely with the customer to find the best and most economical solution for their needs”, according to Van der Ven. “Despite increasing competition in our field, we can generally say we have loyal customers." Van der Ven provides an anecdote from the past: "In 2002 we thought that you just could not survive in the market if you did not standardise. But we kept doing exactly what our customers asked for. No standard work, but made to measure!"